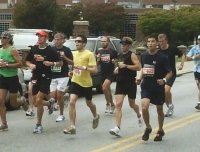 Baltimore's renowned Marathon is a qualifying race for the famous Boston Marathon, but the field is limited to 4,000 strongly competitive runners. The marathon is run each year as part of a one-day running festival, including the marathon itself, a half-marathon, relay race and kid's fun run. Part of the reason for the Baltimore marathon's popularity is probably the fact that the contestants run through the scenic part of this pretty city, along the inner harbour waterfront area, through charming Fells Point and historic Federal Hill.